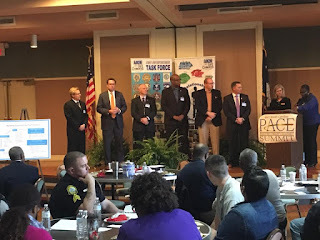 Dr. Clyde Rivers stands with PACE Summit representatives: Aiken Chief of Police, Charles Barranco, Mayor Rick Osborn, C. Ashley Finch of South Carolina Probation, Lance Crick from the U.S. Attorney's Office, Marty Summer, former Chief of Police in High Point, North Carolina, Cynthia Griffin Mitchell, PACE Summit host. 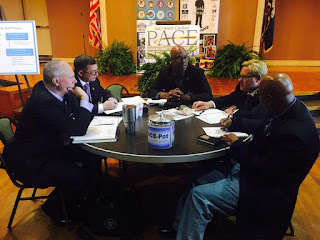 World Peace Ambassador and Golden Rule Dialogue expert, Dr. Clyde Rivers, was in Aiken, South Carolina on the last weekend in January, to facilitate a Law Enforcement and community conciliatory conversation. In what was billed as the 2017 South Carolina PACE (Police and Community Engagement) Summit, Dr. Rivers helped navigate the attendees through three challenging topics: 1.) Unraveling the Criminal Justice System: Rights, Roles and Rhetoric, 2.) 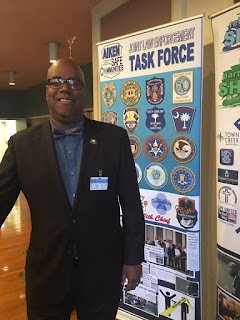 Building Mutual Trust and Legitimacy with Law Enforcement and Community, and 3.) Developing Tools to Effectively Engage Diverse Communities. 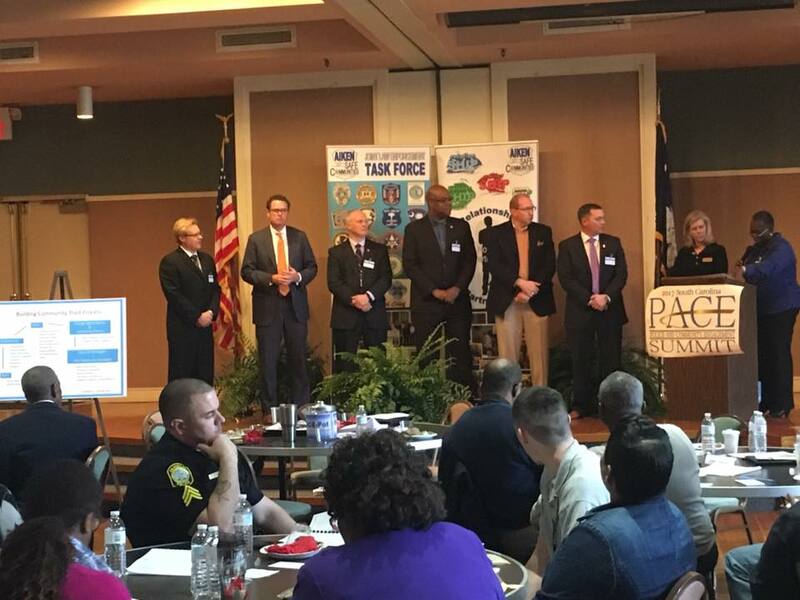 The Summit, which was attended by about 80 people, included the mayor of Aiken, police chiefs, other representatives from law enforcement, fire and safety officials, the U.S. Attorney's office, and various community and religious leaders. Dr . Rivers opened the Summit by speaking to the group about what he has seen all over the world. He explained the value and benefit of having law enforcement by describing what it is like in places that don't have it. Dr. Clyde Rivers facilitates "Listen for Change." "At the beginning of the sessions the questions and comments were filled with fear, suspicion and accusation," observed Professor, Dr. Donni Pitzl, a Golden Rule Dialogue Chamber Leader, "But, by the end of the Summit, the conversation was filled with understanding and intentional efforts to honor one another." That drastic change was due largely to Dr. Rivers' strategy through an exercise he calls, Listening for Change, wherein all parties are asked to genuinely listen to one another. For example, in response to the accusation that police officers target minorities, the officers were able to explain that they are responding to calls. They don't have control over where the calls are coming from. Through that simple exchange, understanding was able to come to the surface. "Even though we have hosted this type of Golden Rule dialogue around the world," said Dr. Rivers "I learned something new today. I saw that each side was approaching the issues from their own histories. I saw that if your history is the only history, then you will miss the history of others." Dr. River's final assessment was that the Summit produced great talks. Even though it was very difficult conversation, there was great participation from all sides. "Everyone wants the same goal," concluded Dr. Rivers. "We all want peaceful community. I believe America, through Golden Rule dialogue, has a great starting point to cultivate safe communities." 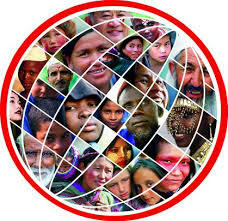 Dr. Clyde Rivers, is the Founder and President of iChange Nations™ and he is the global expert on Golden Rule Dialogue. Dr. Rivers travels the world promoting Golden Rule Dialogue and honoring people who live the Golden Rule everyday. The Golden Rule is simply, “Treat others the way you want to be treated.” Dr. Rivers believes every life is valuable and created for a contribution to our world and that without peace, that contribution can be lost. If that contribution is lost, our entire world loses. "As I travel around the world," observes Dr. Rivers "I see many people who are doing or have done amazing things, but they are often under the radar and out of the spotlight. They are the unsung heroes of our world. I want to honor their service to humanity and inspire others to also strive for something greater than themselves."